Friendly and effective check in Clean room , fantastic bed, quiet Breakfast was ok, sufficient Checkout simple, friendly and quick Only negative: no parking place available for the car ! Excellent Staff, spacious room and delicious pancakes and great coffee !!! I reserved a room for my girls and I for a couple of nights as we were seeing a dance show some 20 minutes away from this hotel. On the approach to the Hotel there were roadworks, however, the drive to the front and parking area of the hotel is sectioned off with low level plastic barriers, so no problem. The external Parking was a reasonable 5 euros per night .The staff here are excellent, friendly when you arrive, and friendly when you leave, from the receptionist to the breakfast staff and cleaner all smiling !! The room was spacious, and yes the bathroom could have done with an update, however , I am not complaining as the reasonable price of the room reflects this. For us , cleanliness, a comfortable bed and good breakfast was what we were looking for and it is what we got!!! We were up on the 5th floor, so families with young children may want to be at a lower level as no security on windows in our room. The coffee here is one of the best I have ever had in an Ibis hotel over the years, the pancakes although cold, were delicious, my girls appreciated the nutella too!!! Great orange presser providing you with a freshly squeezed orange juice right before your eyes!! I would recommend this hotel, mainly because of it's excellent staff, spacious room , comfortble bed, great coffee and pancakes!! This was my girl's and I's experience. Thanks again to the staff ! Excellent Staff, Spacious Room ! Excellente Personnel ! I reserved a couple of nights stay here for my 2 daughters and I, as we were going to see a dance show some 15 minutes drive away! On the approach to this hotel, there were roadworks and the pathway to the parking is lined out with plastic barriers, be sure not to miss the entry point ! Parking was a reasonable 5 euro fee per night. The staff at this hotel were friendly , always smiling, and very professional. The room was spacious, and yes our bathroom could have done with an update, however I am not complaining as price I paid for the 2 nights with breakfast reflect this! For us , cleanliness and a comfortable bed for the night was the most important for us. and it is what we got..we all slept very well !! Our room was on the 5 th floor, so if you have young children a room lower down may be preferable due to not security on the windows, ( at least there wasn't in our room ) The breakfast was good, my girls loved the pancakes, and there also a freshly pressed orange juice machine, just press and voila and some of the best coffee I have ever had in an IBIS hotel over the many years ! The breakfast room is a good size and the walls are prettily decorated to make up for the lack of windows.. I would recommend this hotel, mainly because of the great staff and comfortable spacious room, the coffee and pancakes !!! Thank you to the staff ! The hotel is located in an excellent location, only a quarter hour drive from Geneva. Dear Sir, We very much appreciate your comments regarding your stay at the Hotel ibis Styles Annemasse Genève. It is always a pleasure to receive positive feedback. I will share your comments with our team. I am sure that this feedback will serve as an encouragement to all of our staff as we strive to continuously improve the quality of our services. Thank you again for sharing your experience, and we hope your next visit will be as pleasant as the previous one. We hope see u soon ! Regards. In overall we have enjoyed the stay. We liked the location, price, breakfast and size of the rooms. Personal was pleasant. Thanks for welcoming us. In regards of opportunities for improvements. You have to renew the bathrooms completely as soon as possible. That’s the thing which was annoying us. Also in the winter season in the main window there is a ventilation hole. It was such huge wind blowing from it and all the time making the room cold. It was very difficult to access the hotel due to road construction which has not been announced in any way. The road to parking was complete mud! Alternative parking was almost full and rough to drive. There was road works happening and access to the hotel was not easy. On top you had the noise from the road works. It was dirty, dusty and very unpleasant view. I was not informed by the hotel that all these were happening or else I would have cancelled and booked another place. Nice staff and manager who tried to make our stay more pleasant but there was so many things wrong with the room that nothing can compensate. Upon check-in we were given room 511. Upon entry, immediately noticed were the moldy grout/dirty shower stall and with what appeared to be a burn mark in the shower floor, a similar burn mark was seen on the shelf behind the toilet, bad odor, 'water' damaged baseboard behind toilet (urine smells), hair embedded in hand towel (in thread loops), a large hole/tear in the duvet cover noticed when I pulled the cover back, stained and worn chair cushion and stained fold-out bed. I took photos and went down to the lobby to ask for a cleaner room. The front desk clerk informed me that they were booked up for the night (large group would be there soon) and we needed to talk to the manager the next morning. At this point, we were tired from travels and decided to stayed in the room for the night. That evening my spouse and I took a shower and water splashed all over the bathroom floor as there was no barrier in the opened stall to keep water in. The next morning we talked to the manager and were given room 305. This room seemed cleaner and we continued our reservations with hotel. The breakfast was not great. Some of the cut fruit had &quot;fruit fly's&quot; all over the slices and a dish or two were not clean. The lady was doing her best to keep up with all the dirty dishes but I believe an additional person in the breakfast area would be helpful. We enjoyed the coffee, eggs, toast, and jam but stayed away from any cut fruit. We understand that the massive construction and trash all around the area is out of your control but this information needs to be clearly stated on all booking sites. The last night of our 4 night stay we did not sleep well as the hotel informed us that the air conditioner was switched off and only heat was on. My spouse asked for a portable fan and it was given to us. It was very warm that day and the fan helped but the air conditioner would have been much better. The units should be controlled by the customer. 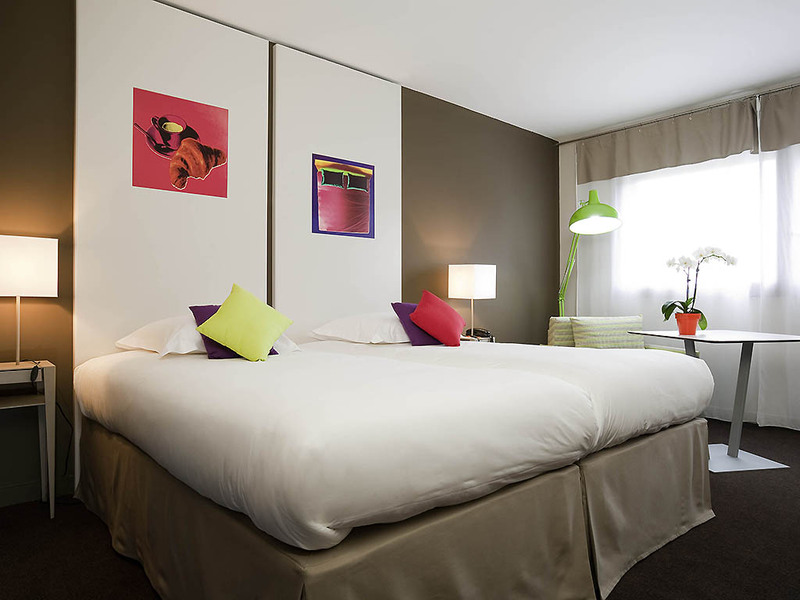 Bright, clean , modern; sufficiently spacious room for two on twin beds. Wi-fi seemed to have a weak signal on the top floor AND staff at reception did not know ‘the password’ to turn on the PC there! ( This happened to put us in a bit of a fix.) Good place- I would definitely stay at the Ibis Styles again. The only positive things I can say about this place are that the lady on check-in was very nice, and it has a relatively secure car park. On the negative side, the area is horrible, the room smelled of damp & sweat and there were no lights working in the bedroom, so I had to read by the light of my smart-phone. Stay somewhere else, even if you have to pay a bit more. I travel a lot for business and always say in Accord hotels, this time I chose this Ibis styles to stay a few days with my family on our way back from our vacation. What a disappointment! first there was no mention that the parking was 10EUR, the service in the desk was adequate but not very friendly. The single beds were fold out couches (not what was said during the reservation, very small and uncomfortable). The shutters did not close well, the water temperature in the showers kept changing if anyone flushed the toilet (my wife and little one got burned!). The room was not cleaned the second day, the beds not made. The breakfast was not good on the second day as some things ran out (at 9h00! ), the OJ machine was broken..... not what one expects for 110 EUR a night! Not the best location. No free parking i secure location. Aircon did not work in first room. Receptionist was helpfull and we changed room. New room smell of mold from air conditioner. But did not want to ask for yet another room. Room was otherwise ok. Breakfast was really good. Like most Accor hotels could have a dedicated motorcycle parking area.